Certain dishes have a special place in my heart and this is one of them. The first real restaurant job I had in San Francisco was at a small place called Ryan’s Café. It was run by a husband and wife team, Michael and Lenore Ryan. They were true “foodies” before that term had even been coined. This Chicken Marsala dish was the most popular dish on the menu and the first one that I was taught. I had cooked with wine a few times at culinary school, but this was the first time that it had really hit me what magic could be created by adding the right wine to certain ingredients. Every time I make this dish, I fondly remember that 23 years old cook (with full head of hair), so thirsty for knowledge, just drinking it all in, both literally and figuratively. Marsala wine originates from the Italian city of Marsala, which is in Sicily. It is similar to the more commonly know Spanish Sherry, and like Sherry is a wonderful wine to cook with. It has a complex, slightly sweet flavor that makes it the perfect choice for this great chicken and mushroom dish I’m demonstrating today. Be careful when buying your bottle of Marsala. You don’t need anything too expensive, but make sure it’s just regular Marsala wine, and not “Sweet Marsala” which is a desert wine and too sweet for this dish. This same recipe can also be made the with Sherry or Madeira wine with very nice results. Button, button who forgot to choose that "public" button? Thanks, Julian, it's fixed! MMM, chicken marsala...one of my favourite dishes (although I don't get to make it very often - my girlfriend is not a big fan). The best part is the mushrooms - they absorb all the flavour from the sauce. My favourite version is Michael Chu's chicken and mushroom marsala from Cooking for Engineers (http://www.cookingforengineers.com/recipe.php?id=59&title=Chicken+%26+Mushroom+Marsala), but i'll have to try your version sometime. I bought the marsala wine tonight at the grocery store. I'm gonna cook it just like you. I will try to make a video of it. Good luck and I hope you enjoy it! Can't wait to see it. Happy cooking! I made the chicken. It was very good. I linked it to yours. Yes I used instant potatoes, I was in a hurry. Many thanks, John, for producing these excellent videos making them available. I came across the Chicken Marsala video on utube last night, leading me here, and being a big fan of this dish I very much looked forward to trying it. Following the basic outline produced truly delightful results! Though I plated Chicken on a linguini nest, I liked the idea of serving it on toasted bread—very cool. My wife and daughter both enjoyed it as well. Thanks again. Chef John, I tried making Chicken Marsala last night BEFORE I watched the video here. Mine was OK, but not what I expected. I think I didn't cook down the sauce well enough. Also, I see many recipes calling for half chicken brests that have been pounded or cut up. What is up with that? Anyway going to try it again with your technique. It probably was the reduction. That's a huge factor in concentrating the flavors. As far as cutting or pounding the breast..its just my personal preference, I like a nice juicy breast and when you pound it, it can easily overcook in the hot sauce at the end. Also, Have a shot of marsala before you start the recipe to relax...and enjoy the experience. I'm thinking about making this for a girl whom I invited for dinner in a few days, but I have only non-sticky pans. Will the sauce and chicken come out differently with my pan? Also, Can I substitute onions instead of shallots? This looks delicious! it will come out OK. You could use onions, but shallots are better in this, and now every large grocery store carries them. Good luck. Can i use "dry" Marsala wine? Thats all they had, except for sweet. And you said not to use sweet. Thanks! Brandy would work, but try to find Sherry which is closer to Marsala. Being English but loving the way this dish is sounding, do you think you might contemplate posting the recepies in euro/mls-grams. I loved the old "imperial measurements", but many in the world just don't get it. Oh, how much difference does using Sherry to marsala make. Just for the lighter side i sms'd my bro earlier to see if he had ever made it, he said only from a jar!!! He thought I meant Indian Mssala!!! Thank God for youtube I suppose. Thanks! Convert to metric? Never! There are plenty of conversion calculators online for the imperically challenged. I have been trying to find a recipe that compares to anything I get in a restaurant. This is the recipe!!! I have tried many other recipes that copy Olive Garden's chicken marsala since I think theirs is consistently good. They were all a let down. Your recipe was easy to make because of great video instructions. I will be sure to recommend your site to others. Thanks so much for sharing your wonderful knowledge and gift with us. Would you by any chance have a favorite recipe of Cream of Mushroom soup? I love the really creamy style, and I don't like any of the recipes I've tried so far. Thanks again for everything, and best of luck. God bless. Someone is actually working on a complete set of transcripts which I will make available soon for a nominal fee to support the site. Until then, juts watch the clip a few times and write the simple steps down. Cooked this tonight, my first ever chicken marsala. The wine and chicken broth reductions weren't quite ready after 5 minutes (my non-stick pans to blame? ), so I just kept it going until it looked like the video. It was very helpful to have a visual of the sauce at the various stages. This dish turned out wonderfully! I can't remember eating marsala this good even in a restaurant. I served it with a bit of angel hair pasta which goes really well with this sauce. Thanks a bunch for this fantastic recipe. Ditto! Great recipe and the video really was helpful (as usual). Simple, elegant, sublime flavors -- the best kind of food. This was very good. The best chicken marsala I have made. I have been trying to figure out a good recipe for it since it is my favorite dish. I think I have found it. And I love the video idea! I got lucky last night after cooking this for my wife!!!! What brand of Marsala wine are you using for this recipe? The only brands I've been able to find are Florio and Columbo in my area, which I'm sure will work fine. I've made this countless times and always to rave reviews...and shamelessly take the credit. Many thanks for making me look good! I often tinker with recipes but not yours. You're invariably spot on. Chef John...I love you! This chicken marsala is first thing I have ever cooked that came out perfect. I cannot believe I cooked something that tastes like it came from a fine restaurant. The key is the video and of course your great recipe and technique. I can't wait to try others. Keep 'em coming. this is an amazing recipe. the first chicken marsala my boyfriend and I had was, at all places - IKEA - and he fell in love! Sadly enough they stopped serving the dish. Ever since then we would order Chicken Marsala from the cheesecake factory and other big name places and he would always be sorely dissapointed. I have made your dish at least 4 times now and my bf is a happy man again. He no longer has to find that perfect chicken marsala dish when we go out - I can make it at home, thanks to you! thanks! i'm glad u guys like it! 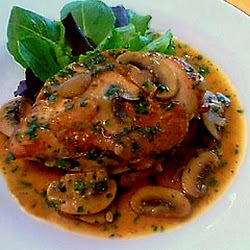 I was in the mood for Chicken Marsala last night and came across Chef John's recipe. My husband went out to get the ingredients we were missing and whipped it up. It was delicious!!! We're actually making it again tonight! Thanks Chef John!! Is there anyway I could make this ahead or at least the chicken without drying the chicken out. I need to make this for a buffet party for about 40 people. Do you have any suggestions? you can, but you have to undercook them a bit and then reheat in the sauce. not easy to do. What's wrong with using non-stick pan for this recipe? I decided to go risky here and used a sweet marsala (even though it said not to)...i added a little extra salt and threw in a little minced garlic...but it turned out beautifully. I served it at a dinner party and it was such a hit. Tender, moist & the sauce really complements chicken breast! Served with angel hair pasta on the side with a little asiago over it & lettuce with lemon & olive oil. Cooked 3 to have one left over for lunch, but got up in the middle of the night to taste the sauce--even good cold! Thank you Chef John for this delicious recipe. I made it tonight following your directions exactly and it came out perfect! My date was so impressed. My girlfriend and I used your recipe for Chicken Marsala tonight. It was a great help, the dish turned out great! The only problem was we used a non stick pan and this caused the sauce to be not as thick as we wanted it to be. We paired it with green beans and a fresh carpese salad. Tonights dinner was a success and thanks to you for the helping tips! I made this tonight and it was a big hit with my whole family. We really enjoyed it, and I'm certain it will become a staple recipe in our household. Thanks for the great video recipe! Your video left my mouth watering so I am going to make this for friends this weekend. I will be cooking for 4 so do I simply double the quantities of each ingredient? ie...4 cups of chicken stock and 2 cups of Marsala. It seems like a lot of liquid to reduce. It does make a good amount of sauce, so maybe go 3 cup stock and 1 1/2 cup marsala. Should be fine if you have a nice big pan. enjoy! Hands down, this is the best thing I have ever cooked. Despite having no clue as to cooking the right "doneness" of any meat, the chicken was juicy perfection! I paired it like Cheesecake Factory does: with mashed potatoes and asparagus spears. I cooked the asparagus spears in the sauce to avoid messing up another pan, but wow! they absorbed quite a bit of flavor. I have to make this again!! What kind of wine would you suggest serving with this dish? I just made this and it turned out amazingly! I'll definitely be getting use out of my new bottle of marsala wine. Thanks, Chef John. Hey john, does it matter what type of marsala wine, I mean red or white? I can only find red so far. That odd since Marsala isn't white or red it's a light brown like a sherry. Well it actually comes in three colors, golden, amber, ruby, just don't know how it affects taste as I'm not familiar with it. Wine in general just confuses me, the colors age, regions, brands, subtle differences in flavor, it's too much information lol. Probably amber is the way to go, that sounds like a brown, but I'll sub sherry this time. It's all I got right now besides port but I'd much rather drink the port lol. If using SKINLESS chicken breast should I use a non stick skillet instead? In your Chicken Breasts with Herbs De Provence and Mushrooms you state that "many people trying this at home, would have had problems with the skinless chicken sticking to the bottom of the pan." I was all excited about trying a regular pan for the first time so that the chicken crust leftover would help the sauce, but, now im not sure I should do it. It's OK, you can use either pan for this. Enjoy! Fantastic recipe, and so easy to follow. I was using a non-stick pan and had to let the sauce cook longer as well to get the proper consistency. The chicken turned out wonderful and moist. I paired the dish with some garlic mashed potatoes and my boyfriend and I loved it! Thanks for the great recipe! I made this recipe tonight and it was sooooo yummie.. Although, I think I might have added just a little too much salt.. LOL And I reallllly need to get some good pans. This is the 4th recipe of yours I have tried.. Thanks sooo much! I've made this a bunch since I saw this video. I've tried cooking with wine before but didn't know what I was doing. I didn't reduce it so it just overpowered the food with a raw wine taste so...I quit doing it. Since this I have used red, white and brandy and it's all good. One thing I really like about this recipe is other than it's simple and taste awesome...the glass of Marsala I drink while cooking it makes me feel all good inside. I can't believe all the cooking skilz I've learned on here and how it cost me nada! Hi John, thanks for great info. I want to make this Christmas Day, 6 adults. Thought i should have a little extra so about 10 chicken breasts. The recipie is for 2 breasts, so do I multiply everything by 5?? too much? also, should I use 2 pans or 1 in this case? and what step can i prepare up to without ruining dish and then do pick-up when ready to serve? Thanks so much! Yes theoretically times by 5. I'd use two pans. Shouldn't really make ahead, but you can keep warm for a while when done. stupid question... how come the sauce is lighter at different restaurants? cream? Stupid question... how come some restaurants have lighter looking sauces? the addition of cream? >: Thanks! I recently made this dish for my family, changed nothing and they loved it. Even the small amount of leftover was great the next day. Everyone I made this recipe for LOVED IT. You truly are a genius! My first intro to you was Fried Green Tomatoes and I haven't looked back. Can this be done with chicken thighs? Huge breasts are good but I'm partial to thighs. I too have fond memories of working at Ryan's. What ever happened to them? Are they still in the food business? I wish I knew! Lost contact many years ago. I've tried your Chicken Marsala recipe a couple times; last attempt was done with Sherry since I don't have Marsala available at where I live. The mushroom & sauce were great, but the chicken was usually hit & miss (due to my poor timing & inexperience). It seems to me that the hardest part of this so called easy recipe is to get the technique right, mainly how not to overcook the chicken breast. Really delicious! I've tried a few Chicken Marsala recipes and none of them were ever quite right...they were always just ok until now. So simple yet so tasty . My husband couldnt get enough of the sauce and the chicken was very moist and flavorful. Bravo! I made a version of this tonight for my in-laws and family. I started with boneless, skinless breasts pounded thin, seasoned with salt, pepper, and cayenne, and dredged in flour (see Chef John's chicken piccata recipe). I cooked them about 3 minutes per side and set aside, then followed Chef John's instructions for the marsala sauce. I used 1 cup marsala and 1 cup chicken stock, and felt that this made plenty of sauce -- more than enough for six adult-sized portions (and we have enough sauce left over that we're going to try and use it on some kind of pasta tomorrow). I really liked the way this turned out. Thanks for the great recipe Chef John! I have tried making this recipe several times, but I fail to get the sauce to thicken like it does in the video. I think that I even use more flour than Chef John, but I continue to get a reduced (tasty) sauce, but the sauce still has a runny consistency. Wondering if anyone has any advice. I've done corn starch and that does the trick, but I'd like to know what I am doing wrong. Thanks! Made this tonight and it is better than the restaurant's where I used to work (as a waitress...) I love to follow your videos. They are so informative, I get to see how it's done, and I'm even learning to add my own special touches. My family calls me " Chef Dawn" ! I so enjoy creating in this way, thank you for making cooking so fun! My two favorite things when cooking - fresh ingredients and a nice glass of red wine! I only have skinless boneless chicken breasts. If I use these, would these be half as good as yours? I have no idea how much you'll like them, so I can't say if it's half! Tracked down a bottle of Marsala and made this tonight and it was fantastic. The toast was a nice touch. What the 2007 Chef John lacks in audio quality and resolution, makes up for in beautiful pan sauces perfect technique demos. You still have that good stuff Chef John, amazing post. Joking aside I am sad I have only Finally just tried this one. As usual, keep up the great work. CJ, I made this last year for Valentine's Day, going to do it again tomorrow. What is that side salad you used for this? I do not like cooking with stainless steel pans. some fond. Thank you for your help. that could take hi heat and leave some fond. steel all clad type. Thank for help. Sorry, but I'm not familiar with those kind of pans! There's really nothing that works like stainless steel unfortunately. Would it make much difference if I used Ghee (clarified butter) in this dish? I'm thinking of trying it tonight. Hey Chef John I've been watching your page for years and this is the first time I've left a comment. I made this recipe tonight and I was overwhelmed with the result. I followed it pretty much to a T and I will be re-creating this again soon!! Love your show on YouTube and have learned how to cook by watching your videos over the years. You're the man!